Must See: Viola Davis' InStyle Magazine Cover is Absolutely STUNNING! InStyle Magazine is kicking things off with a bang! 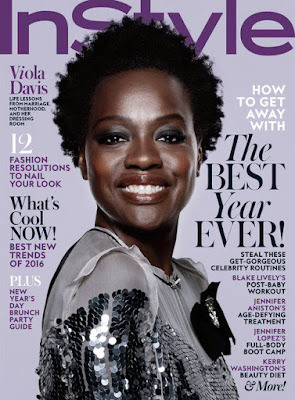 I love their January cover selection - actress Viola Davis is perfection! That skin, that afro, that smile - what is there not to love?! Even though the January issue of InStyle hits newstands on December 11, the magazine gave us a sneak peek into what they dished about with the actress. Viola on aging "What's released me most from the fear of aging is self-awareness," she says. "I've never determined my value based on my looks or anything physical. I've been through a lot in life, and what has gotten me through is strength of character and faith." On style comparisons to the character she plays on How To Get Away With Murder "If I were to compare my style to Annalise Keating, I would say that I have absolutely no style," she says with a laugh. "Annalise Keating is an Alexander McQueen, kinda Max Mara girl. That's not me. I have a five year old, so..."